PAUL DRAKE *IS* PERRY MASON! 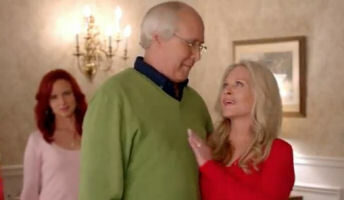 Thanks to it being posted online, this video is probably part of the TV Universe now. Normally, had it never seen the light of day, it wouldn't be incorporated into the Toobworld Dynamic. As I'm just about to post this, it occurs to me that there is a way to splain this and even keep it somewhat in the main Toobworld. 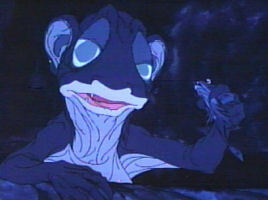 Gollum first appears in "The Hobbit". He lived on a small island in the centre of a lake at the roots of the Misty Mountains. He survived on cave fish, which he caught from his small boat, and small goblins who strayed too far from the stronghold of the Great Goblin. Over the years, his eyes adapted to the dark and became "lamp-like", shining with a sickly pale light in the dark. Bilbo Baggins stumbled upon Gollum's lair, having found Gollum's ring in the network of caves leading down to the lake. At his wits' end in the dark, Bilbo agrees to a riddle game with Gollum on the chance of being shown the way out of the mountains. In the early editions of "The Hobbit", Gollum was characterized as being less bound to the Ring than in later versions; he offered to give the Ring to Bilbo if he lost the riddle game, and he showed Bilbo the way out of the mountains after losing. But to fit the concept of the ruling Ring that emerged during the writing of "The Lord of the Rings", Tolkien revised later editions of "The Hobbit": the version of the story given in the first edition became the lie that Bilbo made up to justify his possession of the Ring to the Dwarves and Gandalf. In the new version Gollum pretended that he would show Bilbo the way out if he lost the riddle-game, but he actually planned to use his ring to kill and eat the hobbit. Discovering the ring missing, he suddenly realized the answer to Bilbo's last riddle — "What have I got in my pocket?" — and flew into a rage. 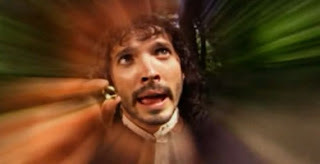 Bilbo inadvertently discovered the Ring's power of invisibility as he fled, allowing him to follow Gollum undetected to a back entrance of the caves. Gollum was convinced that Bilbo knew the way out all along, and hoped to intercept him near the entrance, lest the goblins apprehend Bilbo and find the ring. 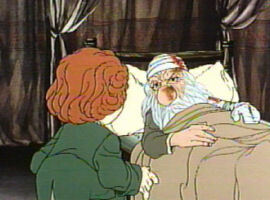 Bilbo at first thought to kill Gollum in order to escape, but was overcome with pity, and so merely leapt over him. As Bilbo escaped, Gollum cried out, "Thief, Thief, Thief! Baggins! We hates it, we hates it, we hates it forever!" In the first edition of "The Hobbit" Tolkien made no reference to Gollum's size, leading several illustrators to portray him as being very large. Tolkien realized the omission, and clarified in later editions that he was of average Hobbit size. "The Lord of the Rings" characterizes him as slightly larger than Sam. 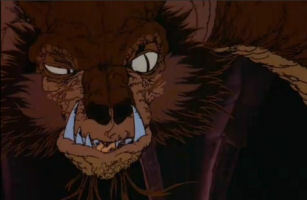 Tolkien describes Gollum as either dark, bone-white or sallow (pale yellow); at one point the Men of Ithilien mistake his silhouette (seen from a distance) for a tailless black squirrel. In a manuscript written to guide illustrators to the appearance of his characters, Tolkien explained this by saying that Gollum had pale skin, but wore dark clothes and was often seen in poor light. "The Hobbit" states he has pockets, in which he keeps a tooth-sharpening-rock, goblin teeth, wet shells, and a scrap of bat wing. "The Hobbit" describes him as thin, with only six teeth sharpened into points. Comparing him to Shelob, one of the Orcs describes him as "rather like a spider himself, or perhaps like a starved frog." Gollum is described as "a small slimy creature" (in "The Hobbit"), and emaciated and gaunt, but possessing a vicious, wiry strength. It would appear that the character designer took that description by the Orc of Gollum being a starved frog and ran with it. Tolkien implored illustrators not to depict Gollum as a monster, but this goes beyond that; he's a totally different species instead of the Stoor Hobbit who was "stretched thin" by long exposure to the Ring. 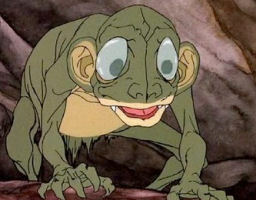 This Gollum is the second worst realization of a character from "The Hobbit" and is only saved from the absolute nadir by the casting of Brother Theodore as the voice of Smeagol/Gollum. Thorin and Company was a group of thirteen Dwarves, the Wizard Gandalf, and the Hobbit Bilbo Baggins that were led by Thorin Oakenshield. Their purpose was to regain the lost Dwarven kingdom of the Lonely Mountain (Erebor) from the Dragon Smaug. Successful at the conclusion of the Battle of the Five Armies, the group paved the way for the future defeat of Sauron and the restoration of peace in Middle-Earth. The formation of the group grew out of a meeting Gandalf had with Thorin in Bree which led to his interest in recapturing his long lost family inheritance. Remembering that he had once known an adventurous Hobbit on his travels in The Shire, Gandalf decided to add Bilbo to their company because he knew that stealth and cunning were preferable to force. 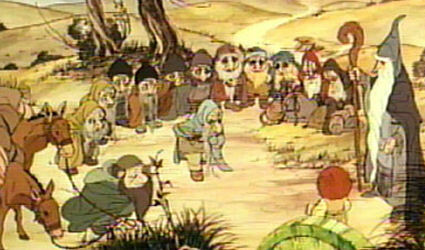 The superstitious Dwarfs also considered thirteen to be an unlucky number of persons, and as Gandalf had planned to leave on other business, needed an additional man to fill their party. The deeds of Thorin and Company led to the restoration of the dwarvish dynasty in the Lonely Mountain, the Kingdom of Dale, the rebuilding of Lake-town and restoration of peace and prosperity in the immediate area for many years. In the long term, the journey of Thorin and Company and the situations it created led to the Council of Elrond and the formation of the Fellowship of the Ring many years later. It also depleted the forces of evil so that later Sauron would have less of them to call upon during the War of the Ring. Today's the day when "The Hobbit: An Unexpected Journey" opens in theaters! Thorin Oakenshield, son of Thráin, son of Thrór, King Under the Mountain is a major character in "The Hobbit" and is mentioned in passing in "The Lord of the Rings". He was the leader of the Company of Dwarves who aimed to reclaim the Lonely Mountain from Smaug the dragon, and was the son of Thráin II, the King of Durin's Folk in their exile from Erebor, and the grandson of King Thrór. In "The Hobbit", Thorin and twelve other Dwarves, mostly relatives of his or others of Durin's Folk, visited Bilbo Baggins on Gandalf's advice to hire him as a burglar, to steal back their treasure from Smaug. He especially wanted the Arkenstone, the Heart of the Mountain. 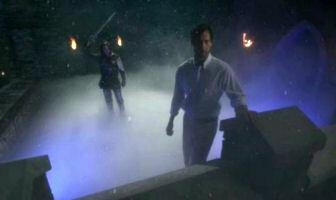 He alone was not taken by complete surprise when the company encountered a band of Trolls, and he and Gandalf fought valiantly in the Goblin tunnels. Thorin was the first to be captured by the Wood-elves of Mirkwood, and insisted that the other Dwarves not disclose their quest to their captors. He was the first to emerge from the barrels at Lake-town and marched right up to the leaders of the town, declaring himself as King Under the Mountain. Thorin was furious when Bilbo stole the Arkenstone to use as a bargaining counter with Thranduil, the Elvenking, and Bard the Bowman, both of whom had some claim to the treasure. The conflict was averted by an attack of Goblins and Wargs, and the Dwarves joined forces with the Elves, the Men of Lake-town, and the great Eagles to defeat them in what came to be known as the Battle of Five Armies. During the battle, Thorin was mortally wounded, but before he died he made his peace with Bilbo. For me, Hans Conreid can do no wrong and I enjoyed his performance as the voice of Thorin Oakenshield. And the depiction of the dwarf leader comes closer to how I envisioned Thorin than what I have seen of Richard Armitage in the role. But, sad or merry, I must leave it now. There are plenty of Zonks to go around for everybody! I'm assuming, of course, that the Cineverse has multiple dimensions just as the TV Universe does. After all, you can't have so many world-ending movies like "I Am Legend" and "When Worlds Collide" sharing the same dimension, right? The Cineverse is not my stomping grounds, so I wouldn't impose the same rules that apply in the Toobworld Dynamic to the movie world. But I would think that unless there was some reasonable splainin as to why there were genetic manipulations involved with the Griswold kids, than each movie should be in its own dimension because of the Rusty and Audrey recastaways. If we accept "Hotel Hell Vacation" as part of the TV Universe, then it makes it easier to claim that most of these recastaways are strictly from their respective movies. That's because Travis Greer played Rusty in that (with a wife and kids of his own). Even though Audrey didn't appear in that promo video, Dana Barron is definitely the Audrey of Earth Prime-Time. That's because she reprised her original role as Audrey in the TV spin-off movie "National Lampoon's Christmas Vacation 2: Cousin Eddie's Island Adventure", the only member of the Griswold famiy to do so. Clark Griswold never addresses Dana Barron and Anthony Michael Hall as "Original Audrey" and "Original Rusty". And Juliette Lewis is never tagged as "Christmas Audrey". Only "Euro Rusty" gets the name-check. Since she is so prominent in all of the commercials, maybe younger viewers might think Ms. Lewis was the original Audrey. 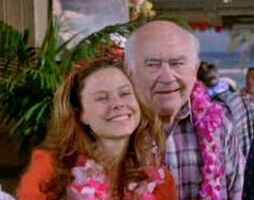 The Rusty and Audrey of the movie "Vegas Vacation" aren't even considered. All of the other extras in these blipverts would be pan-dimensional in-laws. There are the two wives of Original and Extra-Crispy -# er, I mean Euro Rusty flanking Christmas Audrey, and the good-looking guy is either the husband of Original Audrey or Christmas Audrey. Old Navy spent a lot on these ads, what with Martin Short as the narrator for all three and Johnny Mathis appearing as himself in one of them. But I think it would have put a huge strain on the budget if they pushed to get one more addition to the cast - Johnny Galecki, now of 'The Big Bang Theory', played "Christmas Rusty". Sadly, the Audrey of "European Vacation" couldn't be involved as Dana Hill had passed away from diabetes complications in the mid-1990's. Since Ms. Hill's death, I've always been under the impression that it was Dana Barron who passed away, even with seeing her in an episode of 'Babylon 5'. So working on this piece at least rectified that mistake. 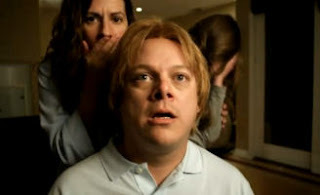 I'm glad to see Ms. Barron has current credits on her resume; I always liked her in the movie "Heaven Help Us". Thranduil is a fictional character in J. R. R. Tolkien's Middle-earth legendarium. He is a supporting character in "The Hobbit", and is referenced briefly in "The Lord of the Rings", "The Silmarillion" and "Unfinished Tales". Thranduil first appears in "The Hobbit" as the Elvenking, when Bilbo and the Dwarves enter his realm in the northern part of Mirkwood. The Dwarves are captured by Thranduil's guards and locked in his dungeons when they refuse to divulge their intentions. 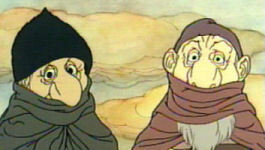 The Dwarves were rescued by Bilbo, who had remained in hiding with his use of a magic ring of invisibility. After the death of the dragon Smaug, Thranduil along with people of Lake-town demanded a share of the treasure of Erebor. War with the Dwarves was averted by the arrival of a goblin/warg army and the ensuing battle. Thranduil was the father of Legolas, a supporting character in "The Lord of the Rings". The gradually-established friendship between Legolas and the Dwarf Gimli, the son of Glóin of "The Hobbit", helps to reconcile Thranduil's people and the Dwarves. The appendices to "The Return of the King" note that Thranduil withstood attacks by Sauron during northern battles of the War of the Ring, meeting with Celeborn and his people to together destroy Dol Guldur and cleanse Mirkwood of Sauron's taint of evil. Also, Legolas and the Silvan Elves later worked together with Gimli and the Dwarves to rebuild and improve Minas Tirith, capital city of Gondor, the realm of their mutual friend Aragorn. The last time Thranduil was mentioned was soon after Sauron's final defeat. 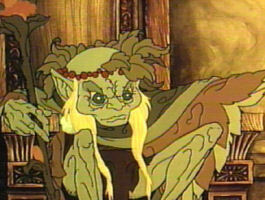 This depiction of Thranduil has to be the worst-realized character in this production. (Gollum would have been the worst, but he's saved by the vocal casting.) With his green skin and ugly Rackham-like features, Thranduil looks more to be a goblin than a stately and regal elf kind. One would be hard-pressed to find any kinship between the woodland elf and Elrond. The casting of Otto Preminger with his thick German accent only makes matters worse and further reinforces the idea of Thranduil as a goblin. 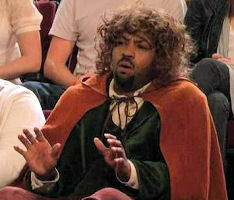 Later known as Bard I, he appears in The Hobbit. 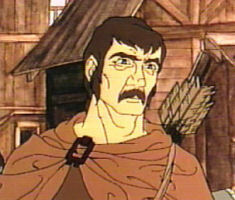 Bard of Esgaroth was a skilled archer and the heir of Girion, the last king of old Dale. He was described as "grim faced" and while a guardsman of Esgaroth he was often predicting floods and poisoned fish. He rallied the guards to defend the town when the Dragon came. 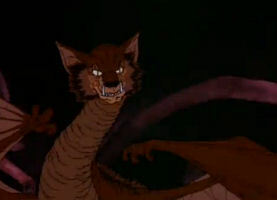 Bard was able to slay the dragon Smaug with the Black Arrow after a tip from the old thrush (who had overheard Bilbo Baggins' description of Smaug) had revealed an unarmoured spot on the dragon's underside. Bard claimed a twelfth of the treasure amassed by the dragon, which he subsequently shared with the Master of Esgaroth to rebuild the town, but the Master stole the money and ran off into the wild where he died. After its rebuilding, Bard was the first king (Bard I) of restored Dale, followed by his son Bain, grandson Brand, and great-grandson Bard II. 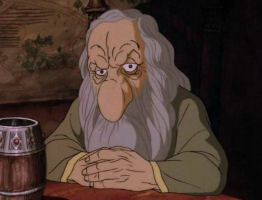 In Peter Jackson's upcoming three-part adaptation of The Hobbit, Bard will be played by Welsh actor Luke Evans. At the end of last month, I shared my theory about the ending for 'How I Met Your Mother' as well as another which was posted on Facebook. Hatter Mercantile - tip of the same to the Mad Hatter? Charles Dodgson - their mark's name was the same as the man who wrote the "Alice" books. 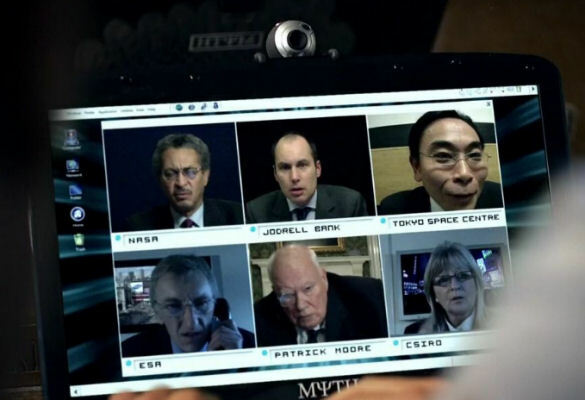 Mr. Carroll - Dodgson's assistant had the same name as Dodgson's nom de plume. Alex Liddell - the inspiration for Lewis Carroll was a young girl named Alice Liddell. However, I don't attach any special significance to these names. It's just a coincidence that they all occurred in a con job that was named after a major character in the books. Longtime sportscaster Arnold Dean, creator of one of the first sports call-in shows, has died at age 82. He passed away Saturday at his home in Rocky Hill. Arnold Dean is known around our area as the "Dean of Sports." His career in sports broadcasting spans more than 60 years. 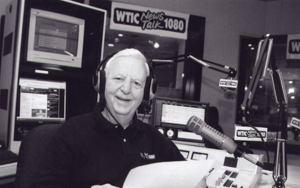 He spent much of his career at WTIC-AM in Hartford, starting in 1965. The radio station says he began hosting "WTIC Sports Talk with Arnold Dean," in 1976. It was one of the earliest all-sports call-in shows. Elrond Half-elven is a fictional character in J. R. R. Tolkien's Middle-earth legendarium. He is introduced in The Hobbit, and plays a supporting role in The Lord of the Rings and The Silmarillion. Elrond was Lord of Rivendell, one of the mighty rulers of old that remained in Middle-earth in its Third Age. His name means "Vault of Stars", "Star-dome", or "Elf of the Cave" (the exact meaning is uncertain, as Tolkien gave different derivations in different places). He was the son of Eärendil and Elwing, and a great-grandson of Lúthien, born in Beleriand in the First Age, making him well over 6,000 years old by the time of the events described in The Lord of the Rings. 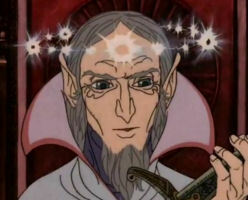 Elrond's twin brother was Elros Tar-Minyatur, the first High King of Númenor. Although Elrond was considered half-elven, that was not meant to be an exact percentage value; he and his brother Elros were also descended from the Maiar, angelic beings who had come to Middle-earth thousands of years before. Elrond, along with his parents, his brother, and his children, were granted a choice between Elven or human fates by the Valar. Elrond chose to travel into the West and live as an immortal Elf, while his twin Elros chose mortality. Sir Patrick presented the BBC programme 'The Sky At Night' for over 50 years, making him the longest-running host of the same television show ever. Sir Patrick presented the first edition of 'The Sky at Night' on 24 April 1957. He last appeared in an episode broadcast on Monday. Sir Patrick believed he was the only person in the world to have met Orville Wright, Russian cosmonaut Yuri Gagarin, and Neil Armstrong the first man on the Moon. I may have shared this before, but what the Who - it's the Christmas season. Time for re-gifting! Smaug is a fictional character in the novel The Hobbit by J. R. R. Tolkien and the main antagonist within the story. One of the last great dragons of Middle-earth, Smaug rose to prominence by laying waste to the town of Dale and capturing the Lonely Mountain (Erebor) with all of its These events occurred some 150 years before the events of The Hobbit, and Smaug was already centuries old at the time. The Hobbit recounts the tale of a party of dwarves (consisting of a few of the original residents of the Lonely Mountain and their descendants) and the Hobbit Bilbo Baggins (their titular burglar) to recapture the mountain and kill the dragon. In the book, the dragon is sometimes called Smaug the Golden or Smaug the Magnificent. Centuries spent sleeping atop his gold hoard caused gold and gemstones to become embedded in the flesh of Smaug's belly, augmenting the already essentially impenetrable armor of the scales that covered most of the rest of his body. However, when Bilbo observed him in his lair, the Hobbit discovered a small bare patch on Smaug's left breast. When Bilbo discusses this with his Dwarven companions about Smaug's weakness, he was overheard by the thrush that roosted by the mountain's secret door. The thrush in turn told Bard the Bowman of Esgaroth. When Smaug attacked the town, Bard shot his Black Arrow into Smaug's left breast, the weak spot in his armour, and the wound proved fatal. Among the items in Smaug's possession were the Arkenstone and a number of mithril mail shirts, one of which was given as a gift to Bilbo by Thorin Oakenshield, the company's leader. In The Lord of the Rings, set years later, the shirt saved Bilbo's kinsman Frodo from injury several times.